Does your content provide buyers a clear path? I spoke to a standing-room-only crowd on “Speeding the Journey from Content to Cash” at Content Marketing World. Here’s a video of my talk. To speed the buyers’ journey takes the right mindset, the right questions, bold insights, and inventive answers. You can speed the journey from content to cash in 5 ways. 1. See the world through the eyes of your customers. Customers have specific questions, needs, and worries. Help before you sell! A Marketing Profs survey shows that 74% of people trust “non-salesy content,” but 29% say even one product mention is a turn-off that crushes your content’s credibility. 2. Clear the buyers’ path. How does the buyers’ journey look, seen through the eyes of buyers? 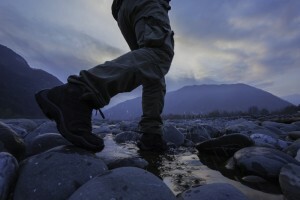 Imagine that your buyers are crossing a river on stepping stones. It’s an uncertain journey. To take the first step is a leap of faith. If buyers succeed, they reach the other side, buy and become your customers. If they fail, it costs you a sale. But in big-ticket BtoB technology, it costs buyers much more – money, time, and perhaps even their career. 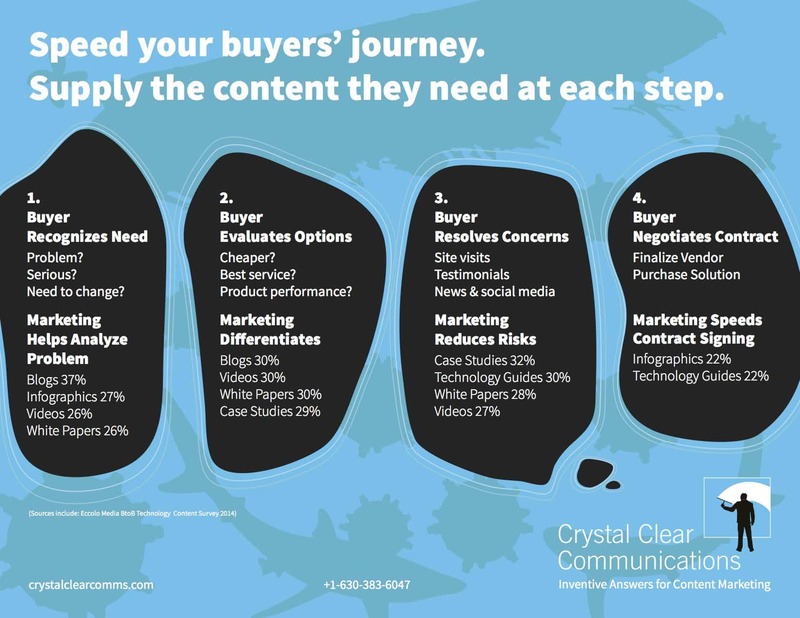 Content marketing infographic: understand which information buyers need at each step in the journey, and which media they prefer. 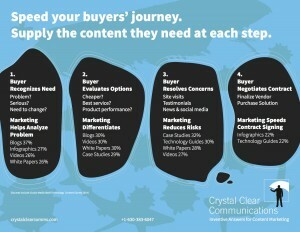 So how do you provide the right content and media so that buyers start and complete the journey? BtoB technology buyers want specific content and media at each of 4 steps in their journey, as you see in this infographic. 3. Apply the right skills and tools. The minimum viable skill set for content marketing includes storytelling, interviewing, writing and editing, design, photos, and video, analytics and demand generation. To succeed, you need all these skills. If you don’t have these skills in-house, you need to hire and add skills or get outside help. To refresh a content marketing program that’s going stale, you need a change agent who can bring you a fresh perspective, bold insights, and inventive answers. And you need the right tools: a one-page content marketing plan, one-page summary of personas, a one-page message map, a one-page editorial calendar, a one-page results summary (plus automation and analytics). Why one page? Most executives only pay attention fully to one page at a time. They don’t want or need to know all the details. And PowerPoint puts them to sleep. So simplify your story down to one page to help execs focus. 4. Cast your content in a clear role. You can be customers’ guru, guide, partner or helper. Which fits your brand best? Keep the voice of your content consistent with your content’s role. 5. Create a content culture. Start with executives: teach them social media one on one, and share your content marketing results sales pipeline and revenue. Work with sales. Teach them social selling. Get their input about customer questions, worries, and problems. Involve your R&D or product team. Teach them to blog, post and present. Gain their input to understand the competitive landscape and sharpen your differentiation. Involve all your employees in content marketing as ambassadors. Teach them social media skills and policies so they can build their personal brands. Share content they can post to expand your company’s social media reach threefold or more. 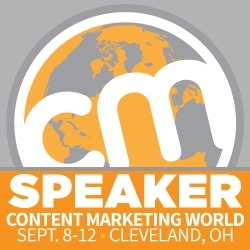 I spoke at Content Marketing World in 2014 and 2013. For more ways to speed the buyers journey from content to cash, subscribe to our blog.